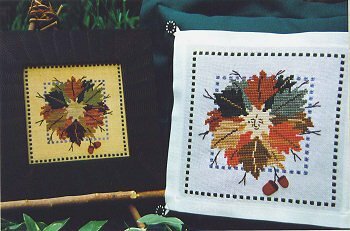 All Fall is the fourth and final chart in the series of seasonal designs that share the same foundation pillow or frame. Stitching the face is optional! Pillow is stitched on a Jasmin 20 count white pillow panel using The Caron Collection Watercolours in Almond, Black Forest, Blackwatch, Caramel, Copper, Marigold, Moss, Periwinkle, and Redwood with JABC pack 5977. Panel is buttoned to a Hunter Green Jasmin pillow. You may substitute any 20 count linen. All Fall framed is stitched on R&R Reproductions 32 count Dark Cappuccino linen using The Sampler Threads Avocado, Blue Spruce, Cherry Bark, Copper, Dark Chocolate, Flax, Nutmeg, Sugarplum and Tarnished Gold. Frame is no longer available.